Use the various links posted on this page to access the official Food Basics job application online. Numerous types of careers can be searched/applied for via the company’s online careers site. Learn more about the online application/hiring processes by following the steps in the guide posted below. The company’s careers webpage allows you to search for current job openings, learn more about the types of positions that are available, as well as apply for numerous careers. About the Company: Food Basics is a Canadian chain of supermarkets based out of Toronto. The company is a subsidiary of Metro, Inc. Metro was founded in 1947 and is headquartered in Montreal, Quebec. Step 2 – We recommend that you open the URL in a new tab/window (so you can follow along with this guide). If you’d rather go directly to the careers page, click the “Apply” button at the top of this page. 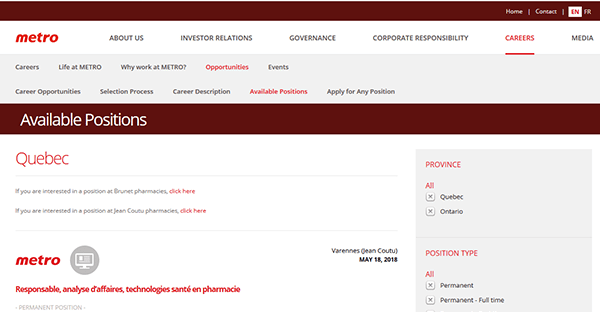 Step 3 – Once you have the “Available Positions” page loaded in a new tab/window, scroll down the page to view the list of current openings. The options on the right side of the page can be used to filter the results. Step 4 – Click the title/link of the position that you’re interested in applying for to learn more about the role. Step 5 – Follow the instructions on the description page to submit an application for the position that you’re interested in.